Brewed in Scotland since 2000 B.C. 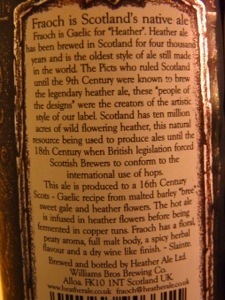 heather ale is probably the oldest style of ale still produced in the world. From an ancient Gaelic recipe for “leann fraoich” (heather ale) it has been revived and reintroduced to the Scottish culture. Into the boiling bree of malted barley, sweet gale and flowering heather are added, then after cooling slightly the hot ale is poured into a vat of fresh heather flowers where it infuses for an hour before being fermented. Come along to The Haven this Weekend for a great Easter celebration. Our piper, Elias, performs on Friday night for Kilt Night 8pm-10pm. Food specials abound! : We have Hot Crossed Buns all weekend, Scottish Sea Trout special, Lamb specials all weekend, Deep Fried Cadbury’s Easter Eggs and Tunnock’s Snowballs! Not to mention our walls are festooned with Easter friendly artwork of SHEEP by Brendan Killian! The Haven really is THE place to be this holiday weekend. Heather Ale- Haven/Notch collaboration – Sir Kenny. The Haven is delighted to anounce the second collaboration with Notch of a delicious legendary Heather Ale. After the success of the Haven 70 special Chris Lohring from Notch and Waddleton went with the addition of Heather for the upcoming brew. Off they traipsed to Maine and hijacked Shipyard brewery for the day. It will be on draft on July 12th. Below is a description of what we came up with….. The Heather Ale combines the malt profile of a Scottish Ale with the hop flavor of a British Bitter, and balances these elements with a background of Heather aroma and flavor. A pound of heather per barrel was used in the brewing of the beer, but the Heather provides a subtle complexity. Heather provides a tea like aroma that balance the Amber malt, and the herbal flavor of Heather balances with the British hop flavor. The Heather Ale is unfiltered, yet with great clarity, and has a light chestnut color. 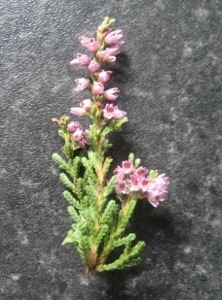 The Heather Tips were grown and harvested in Scotland, and used as a late kettle and hop back addition. And at 4.3% ABV, a wonderful Scottish inspired session ale. NB. We are naming it after the greatest living Scottish footballer and current coach of Liverpool (fenway sports group OTHER sports concern over the pond) Kenny Dalglish. Sir Kenny. 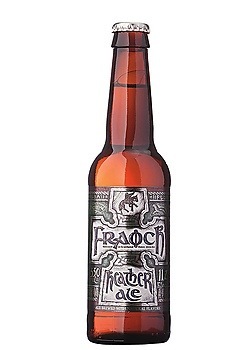 Legend has it that the Picts were wiped out in Scotland for the secret recipe of Heather Ale. Heather must be washed due to the hallucinogenic properties of the flowers.